Are you done with your Christmas shopping yet? If your answer is no, not to worry! 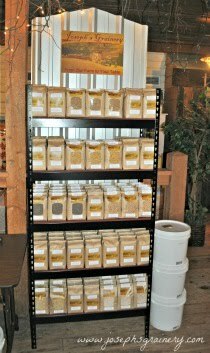 There's still time to make sure everyone on your list can have their favorite whole grain and legume products from Joseph's Grainery! Included in the Kitchen Mixes Gift Pack are a 2-2.5 lb bag of Joseph's Grainery Multigrain Pancake Mix, Whole Grain Cookie Mix Base, Instant Multigrain Mush (BRAND NEW - not available in stores yet!) and Cracked Wheat Cereal. Let us stand in line at the post office for you this year! Order by Thursday, December 18th to make sure it will arrive in time for Christmas.